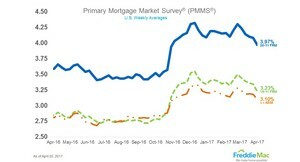 MCLEAN, VA--(Marketwired - Apr 20, 2017) - Freddie Mac (OTCQB: FMCC) today released the results of its Primary Mortgage Market Survey® (PMMS®), showing the 30-year mortgage rate dropping below four percent and hitting its lowest mark since November 2016. 30-year fixed-rate mortgage (FRM) averaged 3.97 percent with an average 0.5 point for the week ending April 20, 2017, down from last week when it averaged 4.08 percent. A year ago at this time, the 30-year FRM averaged 3.59 percent. 15-year FRM this week averaged 3.23 percent with an average 0.5 point, down from last week when it averaged 3.34 percent. A year ago at this time, the 15-year FRM averaged 2.85 percent. 5-year Treasury-indexed hybrid adjustable-rate mortgage (ARM) averaged 3.10 percent this week with an average 0.4 point, down from last week when it averaged 3.18 percent. A year ago, the 5-year ARM averaged 2.81 percent. "The 30-year mortgage rate fell 11 basis points this week to 3.97 percent, dropping below the psychologically-important 4 percent level for the first time since November. Weak economic data and growing international tensions are driving investors out of riskier sectors and into Treasury securities. This shift in investment sentiment has propelled rates lower."